We offer stainless steel flower vases, wedding flower vase, decorative flower vase and metal flower vase which are very durable and are available in a wide assortment to satisfy the demands and tastes of different customers. Symbolizing the rich heritage of Indian culture , these wedding flower vase, decorative flower vase and metal flower vase look extremely splendid with the flowers. Our range is enriched with flower vase, wedding flower vase, decorative flower vase, metal flower vase, bud flower vase, stainless steel flower vase, designer flower vase, flower table vase, antique flower vase, table flower vase, fancy flower vase, flower bud vase, hanging flower vase, modern flower vase. 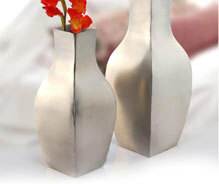 Another of our exquisite collection of metal flower vases with antique look finish. These can adorn your decor for ages with their glittering shine and stupendous style. They can also serve as an ideal gift. 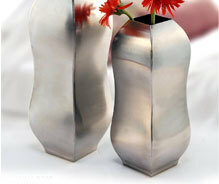 These wedding flower vases are available in many finishes and sizes. 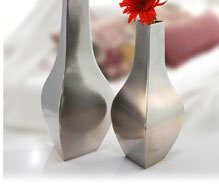 Our designer range of flower vases are a product of innovation and latest styling. We also accept customer specifications. From basic material to the final coating, the customers can give any kind of specifications. And we ensure that the manufactured product is in full compliance with the customer standards. 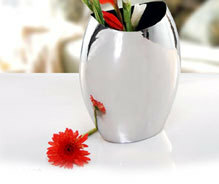 We present our range of decorative flower vases in an array of designs and styles. They come in a spectrum of colors and varied coatings. 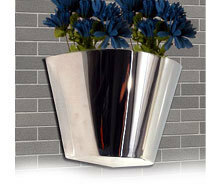 Vases laden with flowers accentuate the look of the rooms and at the same time fill them with fragrance. This range of bud flower vases are chiseled out of a variety of materials in varied shapes are extremely eye-catching with their compelling beauty. We offer these in a numerous sizes, designs and styles. These make exclusive gifts as decorative accents. 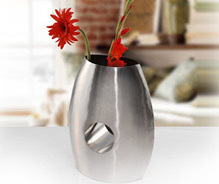 Stainless steel flower vase are meant to case the flowers. Our exquisite range of vases that come in flawless finish and antique look can beautify your decor in an impressive manner. Apart from offering this exhaustive range, we offer customized solutions as well. What more can provide a perfect balance to the natural beauty of flowers than these captivating bud holders. Their stainless steel mirrored finish and exclusive designs not only provide a perfect holding space for the fresh flowers but also enhance the look and feel of the surroundings. 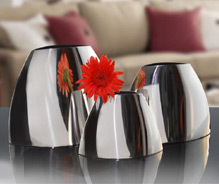 Beautify your decor with our fabulous range of designer flower vases. This splendid collection come in varied molds and have an intriguing oriental patterns. These are polished to perfection. Even after years of usage, these will look as new as right now. 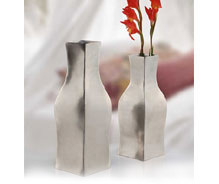 Our explicit range of flower table vases come in an array of designs. These are made of fine metal and endowed with rich shine finish. The extra shine brilliance comes in varied shades. 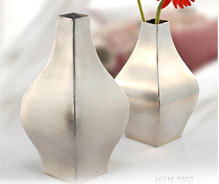 On customer request, we can also manufacture customer specific vases. We offer stainless steel flower vases, wedding flower vase, decorative flower vase and metal flower vase which are very durable and are available in a wide assortment to satisfy the demands and tastes of different customers.